Okay, I didn't need a new bag but when I spotted this canvas tote, there was no way it was staying in the store. The Fabrico Dual Marker (cool gray) and the Sakura IDenti pen (black) worked a treat. Love the bag! one question - What's the tangle that you did on the bottom of the thick band on the first picture! The one that looks like hair with a ribbon woven around it? 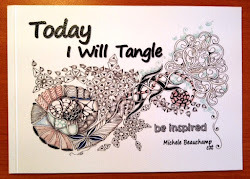 Really cool bag and wonderful tangling! How fun is that - love the bag! 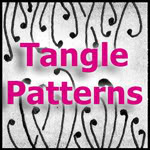 Sue, that tangle is my Brayd, it is usually in a swirl but it looks a bit different here in a straight line with both ends tassled. A tangled tote bag!!! Beautiful!! !